I hate to say it, but winter is not too far from us. It won’t be long before colder temperatures set in on us and we begin to reach for the ice melters and rock salt. Now is a prefect time to begin thinking about whether or not you would like to seal your concrete and natural stone surfaces before the winter. If you plan on doing this work, August and September are great times to start the process and to clean those surfaces so that they can be sealed in time before winter. Step 1 – Clean: Before sealing an exterior surface, you want to make sure that it is clean and dry and these hotter months of the summer are a prefect time to do so. We have many different options in our store when it comes to cleaning the surfaces, including pressure washers and spray or scrub cleaners. The most popular one in our store is the Olympic Deck Cleaner, which can also be used on concrete and other natural stone surfaces outside to quickly take them from dark and dirty to clean and brilliant! (Just take a look at the before and after photos to the right from my own walkway). Step 2 – Seal: Once the surfaces are clean and thoroughly dry, then you are ready to seal! Sealing these porous surfaces before the winter will help prevent damage due to salt and ice melter usage. Sealant will also inhibit stains from gasoline, oil, yard debris, and more. 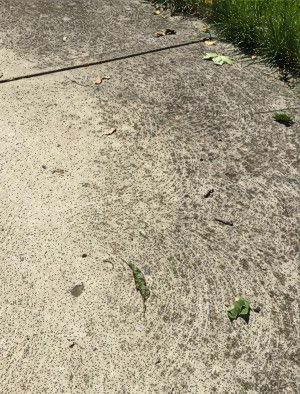 This really is a necessary step in making sure that your concrete (or other stone surface) stays in good condition, year-after-year. For more detailed information on concrete and stone sealers, please reference our blog article from September 2014, or stop by our Paint department where we are always willing and able to help you with all of your questions! Thanks for reading everyone. We hope that you are having a great end to your summer!